RBTH presents a selection of views from leading Russian media on international events, featuring reports on former Italian Prime Minister Silvio Berlusconi’s visit to Moscow and the creation of a new “socio-patriotic” movement aimed at protecting Russia’s image, as well as an interview with a former volunteer in the Syrian conflict. The Kommersant business daily writes that former Italian Prime Minister Silvio Berlusconi is coming to Russia on a private visit on Sept. 9 to meet with President Vladimir Putin. 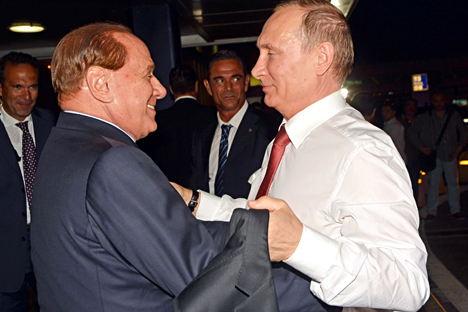 According to the newspaper's Italian sources, Berlusconi plans on discussing the crisis in Syria and Ukraine. The Italian version of the Huffington Post reports that the former Italian prime minister will try "to include Putin in an anti-terrorist campaign, promoting a diplomatic initiative that could lift the anti-Russian sanctions and defrost relations with the U.S."
Despite the fact that Berlusconi's mission does not bear an official nature, Rome might be interested in the former prime minister's mediation, since Berlusconi has preserved friendly relations with the Russian leader. Furthermore, Italian political analysts agree that without Russia's participation neither the Syrian nor the ISIS problem can be solved. According to Italian Prime Minister Matteo Renzi, Italy will not participate in military action on Syrian territory. "What happened in Libya with Gaddafi is a lesson for us. We need to avoid such mistakes when solving the crises in Syria and Iraq," said Renzi. The Izvestiya daily broadsheet writes that Senator Mikhail Marchenko from the Bryansk Region is creating a social-patriotic movement called Zaschitim Rossiyu (Let's Protect Russia), which will respond to the actions of countries aimed at sullying Russia's image. The senator said that the social organization's objective will be to inform citizens of the methods of Western “propaganda” and its representatives in Russia, as well as to organize public events and develop a positive agenda on Russia. "From the western countries we are hearing more and more declarations with various threats, starting with the sanctions and ending with the improper Russian mass media, which incorrectly reports on Russia, the West, Crimea and the sanctions," explained Marchenko. In his words, it is the social activists and the population that must respond to the actions of the West. They must respond by refusing imported goods and supporting domestic production. In the opinion of Sergei Markov, director of the Institute of Political Studies, there is a demand for efficient Russian non-profit organizations. But the latter are established only to make money and share managerial positions, while “the real patriots are fighting without any resources," said Markov. Michel Mizakh, a 25-year-old citizen of Russia and Syria, who several days ago returned from Damascus, where he had been fighting with the Shabikh pro-government armed formation, has spoken about what is happening in the country in an interview with the Moskovsky Komsomolets tabloid newspaper. "My father is from Syria and we have many relatives there with whom we are in contact practically every day. In Syria the war is not against Assad but against civilization as such. ISIS [the Islamic State radical militant group – RBTH] enslaves people, crucifies them, introduces medieval taxes for Christians and kills Shiites and Alawites right on the spot." "Everyone understands that if the Islamists win, things will not be so sweet. ISIS does not take prisoners. When they surround you, forget about surrendering, just think of how to take more militants with you to the other world." Mizakh says that Assad's supporters have held Russia in high esteem since the times of the USSR. "But if the ISIS fighters find out that you are a Slav or have a Slavic wife, then they'll definitely kill you, because since the Chechnya War, Russia has been one of the Islamists' main enemies." Syria will lose only in the event that a no-fly zone is established. Turkey will openly support the militias and the anti-ISIS coalition will openly go against Assad, said Mizakh.